Henri Frédéric Amiel was born in Geneva in 1821. 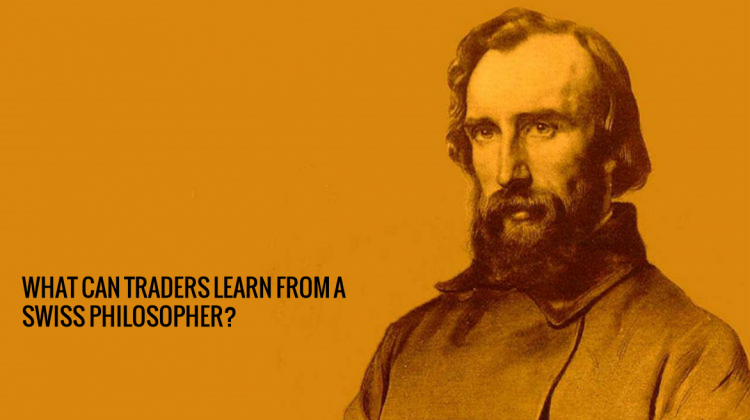 He philosophized, criticized, wrote poems, and died in 1881. I do not know much about him, but recently I saw two of his quotes. These two lines struck me, not only because I agree with them, but also because they are so relevant to trading. I have always observed parallels between life and trading. The lessons I learn about risks and attitudes in trading have molded my outlook in life. And Henri Frédéric Amiel has summed up two key lessons that apply to trading very well. Accepting shades of grey is necessary in trading. Traders who insist on having absolute rules will never trade well. Trading, like life, is not a game of certainty. It is a game of chance. Until we recognize the probabilistic nature of both trading and life, we cannot move ahead confidently. This quote also warns us against analysis paralysis. Some traders analyze the market using every single tool they can get their hands on. They do so thinking that they can eventually get the perfectly clear picture of where the market is going. They will never get it, and they will never decide. This is analysis paralysis. This quote highlights this idea of ex-post regret. I first came across this concept applied in financial markets in Larry Harris’ Trading and Exchanges: Market Microstructure for Practitioners , and Henri Amiel’s quote refreshed it. Basically, it means that regardless of the outcome of your trades, there is always room for regret, due to the way the market works. Let’s say prices hit your limit order at the price target and your trade was profitable. It’s good, but the very fact that your limit order was hit, meant that prices went above your target. Since prices went above your target, you could have placed your target higher and earn even more from this trade. You regret not aiming further. For a losing trade, the ex-post regret is clearer. If prices hit your stop-loss order, it meant that you could have placed a tighter stop-loss and limit your losses. Of course, you might also regret taking the trade in the first place. Despite the grim reality of inevitable regret, being aware of ex-post regret is extremely useful for traders. If you trade, you must accept regret. Once you accept it, you can move on and exploit your trading edge, and not beating yourself over each trade. These are two valuable lessons for traders. They remind us that we decide to trade, despite the shades of grey and the inevitable regret. In trading and in life, acceptance is progress. Before we stop here for you to ponder over the learning points, let us thank Henri Frédéric Amiel, who has, across time and space, reminded us of these important lessons. This is a perfect article and is full of insight.